The Flames (23-13, 9-3 Big South) only scored one combined run in those early-week losses despite coming off a strong seven-game win streak when they averaged over six runs per contest. 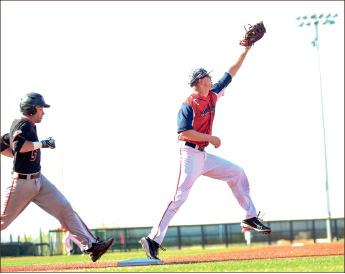 With the Campbell Fighting Camels (25-12, 8-7) in town, the Flames bats came alive once again, combining for 37 hits and 19 runs over three games, taking two of the weekend’s three games in the process. The Flames dropped the series opener Friday night, April 10 against the Campbell Fighting Camels in front of a record crowd of 3,983 at Liberty Baseball Stadium. The Flames took a 2-1 lead into the seventh inning, only to see Campbell score two runs and take a 3-2 lead in the top of the seventh. Senior pitcher Jared Lyons (5-1 1.24 ERA) started for the Flames after recently being named Big South Pitcher of the Week. 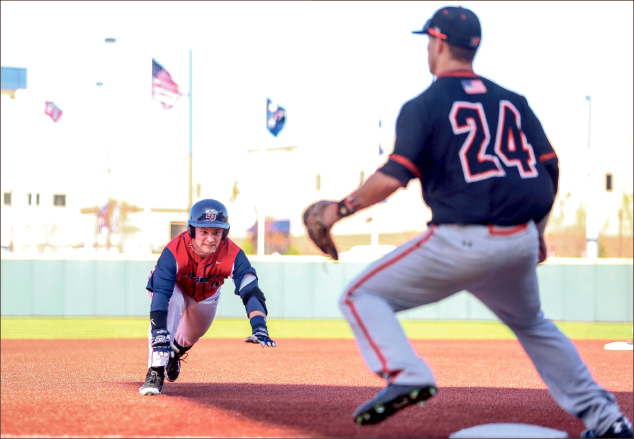 The Flames defense was plagued by five infield errors, including one that led to a run. These errors continued extending innings and allowed Campbell more opportunities to score. The Flames bats heated up in the second inning with shortstop Dalton Britt hitting a leadoff triple. He scored later on catcher Becker Sankey’s RBI double. In the fourth inning, senior first baseman Alex Close, who leads the Flames with a .343 average, hit a leadoff double to get the Flames on base with no outs. He later scored on an RBI single from third baseman Sammy Taormina. The Fighting Camels added their first run in the fifth inning from center fielder Cedric Mullins, who reached first due to a Liberty error. He later scored on an RBI single from left fielder Cole Hallum, who is among the nation’s top power hitters. The Fighting Camels took the lead for good in the seventh inning, adding two runs to take a 3-2 lead. They began the inning with a leadoff double from catcher Steven Leonard, quickly followed by an RBI triple by first baseman Kyle Leady to tie the game 2-2. Leady later scored on a sacrifice fly to give the Camels the 3-2 lead. Lyons left the game after six innings, giving up nine hits along with two earned runs and five strikeouts. Despite the loss, the Flames were proud to set a new attendance record. Head Coach Jim Toman said the record crowd provided a great atmosphere and venue for the game and the Flames players. After losing a close game to open the series, the Flames left little doubt who would win the second game, getting an early lead on the Fighting Camels and never looking back. The Flames came out swinging, literally, as they went up 3-0 in the bottom of the first inning. Senior pitcher and center fielder Ashton Perrit scored to put the Flames up 1-0 in the bottom of the first inning. Sophomore right fielder Will Shepherd then brought home Britt, and Taormina to round out the inning. Britt kicked off the third inning with a triple before Alex Close brought him home with help from a Campbell fielding error. Not long after, with bases loaded, Taormina put the Flames up 5-0 with yet another RBI. Shepherd was next home for the Flames, followed by a bunt from freshman outfielder Josh Close to plate Sankey for what would be the final 7-0 score. Campbell leads the Big South in batting average (.297), but Liberty junior pitcher Victor Cole shut them down, allowing just five hits over eight innings. Sophomore pitcher Caleb Evans took over in the ninth to finish the game, preserving the shutout. The win ended a three-game skid for the Flames. The Flames played their first nationally televised (ESPNU) home game Sunday, using a season-high 17 hits to notch their ninth conference win. Four Flames — Perritt, Taormina, second baseman Clay Keranen and designated hitter Andrew Yacyk —finished the afternoon with four hits apiece. The Flames took the lead in the third inning off a triple from right fielder Shepherd and never relinquished it. Shepherd advanced to home after an errant throw into the dugout from the Campbell shortstop. Senior lefty Shawn Clowers got the win for the Flames and moved to 8-2 this season, tying him for the most wins in the country. DIllard is a sports reporter.